MANILA, Philippines - The traffic enforcer in the viral video on social media due to his sideline of selling 'kakanin' or rice cakes to motorists in EDSA has received praise from MMDA chairman Francis Tolentino on Monday, November 10. Traffic Enforcer 3 Fernando Gonzales, 51, was still shaking in fear after being summoned to the MMDA head office in Makati City. He was anxious as he stood stiffly straight in the presence of his boss. Gonzales thought he will be punished by his boss but he was surprised as Tolentino gave him a nod for working hard and for being a good example to other traffic enforcers. "Gawan ng paraan para ma-promote," Tolentino said to Gonzales' relief. Instead of engaging in corruption while manning Metro Manila's streets, Gonzales said hen is selling rice cakes to motorists for extra income. He further said that P15,000 monthly pay is not enough to support his family. Post by Rose Anne Olarte Mellizo. Gonzales said his eldest son is currently in first year college while his younger son is in third year high school. 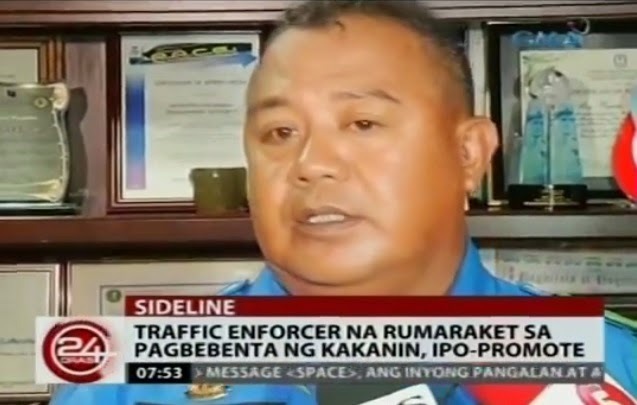 The traffic enforcer said he is selling 'kakanin' during his days-off on Saturdays and Sundays and not during work hours. Gonzales, a graduate of criminology has no blemish on his 20-year record as a traffic enforcer. "Kahit mahirap po ako, ayaw ko pong mapahiya sa mga bata...Kasi po sa probinsiya, kilalang-kilala sila," he said.